Laura McAloon, the mayor's appointment for city attorney, says the frustration she experienced as part of a city committee inspired her desire to improve council-city communication. 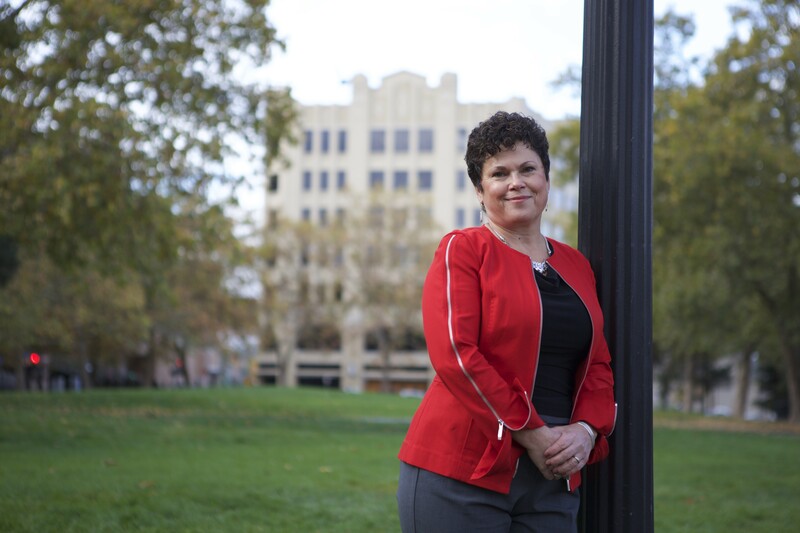 Last week, Spokane Mayor David Condon announced his pick for city attorney: Workland & Witherspoon attorney Laura McAloon. Beyond having represented the city in a variety of legal matters — including the eminent domain of a construction materials business to make way for MLK Jr. Way — McAloon's been serving as one of the mayor's two representatives on the joint committee overseeing the independent investigation into matters concerning former Police Chief Frank Straub. And it was in that role back in February that her frustration with City Council President Ben Stuckart came to a head. In a series of emails, McAloon expressed serious disappointment and frustration with Stuckart. "My feeling is that this joint team is being manipulated for political purposes," McAloon wrote. She conveyed that Stuckart was giving "misinformation" and "inaccurate" statements to the press. She worried about having her "reputation publicly smeared" and the committee "devolving into a political battle." Today, she says she and Stuckart have moved past the issue. But she also says the miscommunication she witnessed between the mayor and the city council weighed on her decision to take the city attorney job. "It definitely informed my decision, knowing that my biggest challenge was going to help encourage communication," McAloon says. "I think a lot of the discord is the result of a lack of communication." The atmosphere in February was thick with uncertainty: Straub had just filed a lawsuit against the city, and multiple questions regarding the investigation were in the air: What did the lawsuit mean for the investigation? How should the committee respond to the unwillingness of city attorneys to be interviewed for the investigation? Can city council members vote to speak about matters which occurred during a confidential executive session? When the city attorney's office weighed in on that last point, suggesting that council members could find themselves in a heap of legal trouble if they talked about a confidential session, it infuriated Stuckart. He told the press he saw the letter as a threat. Stuckart's comments marked a pivotal moment in the fraying relationship between the mayor and the council. But on top of that, Stuckart told media outlets that McAloon had raised the same concerns about executive session. However, bound by a "gentleman's agreement" not to comment on the ongoing investigation, the committee members refused to confirm or deny what Stuckart had said. McAloon would only say that she hadn't talked to Stuckart or given any legal advice during meetings. Today, she elaborates: Stuckart's interpretation was wildly inaccurate, she says. She says she never weighed in on whether the council's executive session could be waived. She does not, however, accuse Stuckart of intentional dishonesty. "Ben was the victim of bad information or poor communication. Somehow it was misinterpreted," McAloon says. "Ben’s in the position of saying something to a reporter that he thinks is true." From the best she can figure out, the root of the misunderstanding came from concerns raised by the independent investigator, Kris Cappel. In February, McAloon says, Cappel had brought forward a number of hurdles she was running into with the investigation. The former police chief and the employee who had accused him of sexual harassment weren't willing to cooperate with the investigation. Neither were the city attorneys. And because of attorney-client privilege issues, Cappel was having trouble getting unredacted access to key documents. McAloon says Cappel asked whether the city wanted to shrink the scope of the investigation in response. McAloon agreed with some of Cappel's concerns, but speculates that Stuckart had misunderstood what joint committee member Brian McClatchey had conveyed to the council president as to her views on the issue. In a flurry of emails to the group in February, she stressed her frustration with how the council president had characterized her position. She'd joined the joint committee, she wrote, to help improve the communication between the city and the council. "Last week's events certainly make me wonder if that is possible given the miscommunication that was publicized as truth," McAloon wrote. The other members of the committee — McClatchey, then-Utilities Director Rick Romero and City Councilwoman Karen Stratton — didn't argue that McAloon had been misrepresented. Instead, they offered empathy, echoing much of McAloon's frustration. "This is a horrible game of telephone," McClatchey wrote in one email. Romero praised McAloon's independence and lamented the politicization of the investigation. "You have done nothing but try to bring reason, logic and honesty to an increasingly political issue — you deserve better than this!" Romero wrote. "I am struggling to see a responsible path forward for the four of us." McAloon pointed to a Feb. 13 Spokesman-Review editorial, which she felt had suffered from Stuckart's misinformation. "I completely agree with the SR when it says the city must do all it can to put truth above all other concerns — and Ben's statements to the media last week do not meet that standard," McAloon wrote in one email to her fellow committee members. "There is a big difference between getting what I called 'informed consent' from the City Council and Mayor and what Ben portrayed to the media as an attempt to hide the facts." "The editorial also perpetuates the inaccurate statement by Ben that our team meetings have been 'ugly' - contrary to what both of you told me you had communicated to Ben," she wrote. "I had hoped Ben would correct his statements himself but he still hasn't called me or responded to my email last week so he doesn't appear to me to be inclined to do so." The group even offered to meet with Stuckart to discuss the issue, but Stuckart repeatedly refused. "The main reason for that decision is his worry that doing so could create the perception that he and the Mayor are running the investigation, or that his presence at such a meeting could undermine the independence of the investigation," McClatchey wrote in an email. "When we spoke, I was very direct in expressing my disappointment in Ben’s recent press conversations. I am confident that Ben understood me and will modify his behavior accordingly in the future." McAloon also proposed the committee put out a joint media release correcting Stuckart's misinformation, but other committee members didn't jump at the opportunity. She also suggested she might meet with him personally. "I will evaluate whether I feel that I should still talk to him as a constituent and as one who supported him in both of his elections," she wrote. "I'll also consider whether I need to personally correct the public misinformation about my role on this team, but I feel very strongly that all of the truth should be communicated, not just selectively — isn't that the reason for the investigation?" Today, McAloon says, she later ran into Stuckart by chance at the city parking garage, and they briefly made sure each other didn't have any hard feelings. "We’ve had lunch a few times and multiple conversations since then," Stuckart says. "It’s not a lingering concern for me." That's not to say they don't have major philosophical disagreements over the investigation. "I'm certainly not the City's defense counsel, but if I were, I would not want a separate investigation being conducted into an issue that is the topic of a pending claim for damages against the city," McAloon wrote in an email in December. Today, she suggests the investigation should have been folded into the Straub lawsuit defense. After receiving the results of the investigation, the mayor and the city council could have decided what to divulge to the public. Stuckart disagrees. "I think that would have been an awful idea," Stuckart says. He argues the lawsuit and the investigation were two separate issues that should be treated separately. Cappel has already completed her initial report, he says, while the lawsuit is under appeal. However, McAloon also supported a plan championed by the city council that would have hired another attorney to allow the Cappel to see confidential documents. Condon rejected that plan vehemently. Stuckart says he'll vote to confirm McAloon. "I believe you can disagree on how the investigation rolled out but still think she’ll be a great city attorney," Stuckart says. "She was very impressive in court. I have a great amount of respect for all the work she’s done with the STA and [as city attorney for] Pullman." Stuckart says he plans to have regular meetings with McAloon, which he never had with her predecessors. "She and I have committed both that once we start, we will rebuild the trust between the city attorney’s office and the council," Stuckart says. "I’m committed to that 100 percent." And where former City Attorney Nancy Isserlis rarely ever spoke to the media, McAloon has a different philosophy. "My experience with media is that the more we sit down and talk with you and the more you understand, the more accurate your reporting is," McAloon says. Her first-hand experiences with the communication malfunctions between the city administration and the council have given her a clear goal as city attorney. "The breakdown in communication in the city, I think is the No. 1 problem and the No. 1 frustration as a citizen who wants the government to function," McAloon says. "I’m willing to push people to communicate and collaborate. Whether to figure out how to draft an ordinance or figure out how to protect the city from legal exposure."